BEIJING - Health experts have warned the public that pollution and environmental deterioration are behind rising cancer rates among Chinese children aged under 14. Aspirin a day keeps cancer away? The Chinese mainland now has more than 32,000 children aged under 14 suffering cancer of various kinds, which translates into a prevalence of 104 in 1 million, Zhang Guangchao, general secretary of the Chinese Anti-Cancer Association and an expert in childhood cancer, said on Thursday. "Notably, the fatal disease, long considered a problem in senior years, is striking more and more children. Major risk factors include pollution and unhealthy lifestyles," Zhang told China Daily at an awareness-raising event held on Thursday by sohu.com, one of the biggest online news portals in China. The most common kinds of cancer among children are leukemia, lymphoma and brain cancer, he said. The incidence of bone cancer is higher among teenagers than younger children, he added. "Personally, I've seen more cases of children developing leukemia after home decoration," he said. 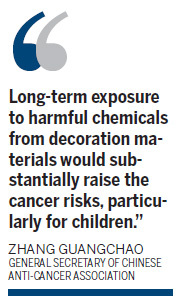 "Long-term exposure to harmful chemicals from decoration materials would substantially raise the cancer risks, particularly for children," he said. Similarly, parents' occupations are also related, studies have found. People such as drivers and painters are more likely to be exposed to lead and this means their children face higher risks of cancer, experts said. Child cancer patients show common symptoms, including persistent low fever, weight loss for unknown reason and nose bleeds, said Zhi Xiuyi, a Beijing-based lung cancer expert. Zhi also warned parents that unhealthy lifestyles greatly increase the risk of cancer, which is "a lifestyle chronic disease". It has been scientifically proven that factors such as obesity, physically inactive lifestyle and high-calorie diet are also factors in the development of childhood cancer, he said. "Early intervention in children's unhealthy lifestyles will greatly lower their risk of developing cancer both in childhood and adulthood," Zhang said. For instance, without intervention, overweight children, who are usually meat lovers, often become obese adults, who face much higher risks of breast and colon cancers, he said. "Cancers of the breast, skin and colon are more related to unhealthy lifestyles than lung and liver cancers," he said. "The rates of these cancers are rising rapidly among Chinese people, who have become richer in recent decades and have then adopted a Western lifestyle," said Zhi.